It’s five o’clock am, wow, definitely early in the morning, and why I got up so early? (I got up at 6:20 am, usually) Just because I have decided to write some thing from last Friday. But unfortunately, things have been getting hectic, you know, the business stuff, maybe I’m not a good superior, i have been trying my best to not be too mean to make stress to my team members. But if you can’t transmit the stress down, you will get it yourself…Ok, stop complaining, peng, be tough. Jing get back today, at 7:04 to be exact, Jing is a daughter of the youngest sister of my mother. So Jing is my cousin, and also a best friend of mine. We got allot stuff in same. 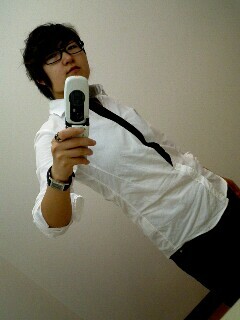 Most of time she is a boyish girl, she like to keep her hair short, I think it fit her well, make her cool. We play basketball together, we climb wall together, we do workout together to make more muscular. Haha~ I like hanging out with her. The last five years, she was living in Japan. And last week, she came back to Beijing for job, and she will arrive in Haerbin today. So a family party will be hold tonight to welcome boyish girl coming back. And I will pick her up in hour. Oh, I have to get my breakfast and get a cab to the train station. Hi, I get back, boyish girl doesn’t change much, still boyish 😀 And the luggage was so big and heavy. Heavy physical labor makes me really thirsty. But you know what , I just found that some important files in my notebook couldn’t work. It seems that the anti-virus was also helpless, every time bad things happen, I prepare for the worst. So maybe I will do the files once again, and it will take me 3 hours or 4. Deep breathing, don’t make it a big deal. Oh, happy children’s day, Katy, greeting from haerbin. Thank you, Katy, first of all, my business stuff have been done well, and second, i got a little drunk last night, in the family party, Jing did too. 😀 i’m sure that we will hang out frequently this week with other cousin of mine. it will be fun. life shouldn’t be so busy, i consider the posting time as a enjoyment of mine. so i squeeze in like you do, as more as i can. In my opinion, you should pay more attention to your rehearsal and you health these days, i mean it seems that you are staying up late again. glad it all went well! Even for being boyish, she’s still pretty! haha Sometimes it so hard to find something to post about…so yeah I know the feeling. Thank you, tia, you know the feeling, some time, you want to post something interesting to share with your friends, but life was boring, however you post it, and your friends read it and leave a reply, maybe it is not boring anymore, so, everytime i receive new comment from yours, i’m so glad and can’t wait to reply, it’s great, so thank you, tia. haha you’re welcome! I love commenting…especially with those who comment back. 😉 I can totally relate: when I post something that seems really boring, I get the most comments. When I post something I think is amazing, I don’t get that many comments. Weird.